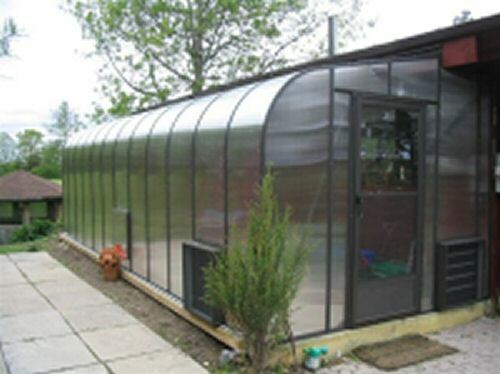 Category: Greenhouse Kits, $2,001 - $5,000, Lean-To Greenhouse Home Attached, Pacific Series - Twinwall Poly Lean-to, Twin Wall Polycarbonate Lean-to Greenhouses, More..
Not only is this quality lean-to greenhouse kit an architectural delight with its curved eaves, it is sure to create a stunning focal point in any garden setting. This popular lean-to is designed to attach to an existing wall and is designed to offer the maximum natural light for year-round greenhouse gardening. The Twin Wall polycarbonate lean-to offers both beauty and durability. This 6mm Twin Wall polycarbonate lean-to greenhouse kit has been designed and constructed to the highest engineering standards for over 50 years!